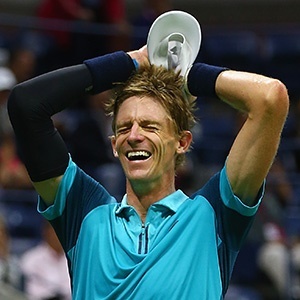 Johannesburg - South Africans should brace themselves for history to be made when Kevin Anderson meets World No 1 Rafael Nadal in the US Open final at 10pm tonight. Following a career-threatening injury last year that saw him miss the first Grand Slam event of this year, the Australian Open, the 31-year-old South African, who stands 2.03m tall, has risen like the proverbial phoenix. In defeating Spaniard Pablo Carreño Busta 4-6, 7-5, 6-3, 6-4 in the semi-final in the early hours of yesterday (South Africa time), Anderson not only reached his first Grand Slam final, but is also the first South African player to do so in 33 years. Kevin Curren was the last when he lost in the 1984 Australian final. Curren had adopted American citizenship by the time he succumbed to teenager Boris Becker in the Wimbledon final the following year. The last player from these shores to reach the US Open final was Cliff Drysdale in 1965. The last South African to win a major was Johan Kriek, who took the 1981 Australian Open title. He had also become an American citizen when he won the 1982 Australian Open. Incidentally, Anderson has been based in Florida in the US, where he bought a house in 2011, but still maintains his South African citizenship. Standing between the Johannesburg-born Anderson and victory will be Nadal, who is not only a world No 1, but entered the tournament as the top seed and boasts an impressive 15 Grand Slam titles. Anderson last reached a quarter-final at the US Open in 2015. At No 32, he is the lowest-ranked US Open men’s singles finalist since the Association of Tennis Professionals rankings began in 1973. Speaking immediately after his historic achievement, an excited Anderson said: “It’s been a long road. We’ve been privileged to play in these tournaments against some of the game’s great players. Tennis South Africa (TSA) chief executive officer Richard Glover was thrilled when he spoke to City Press yesterday, saying Anderson’s heroics would inspire young South Africans from all communities to play tennis. “It shows that, through courage, determination and hard work, a player from the southern tip of Africa can make it on the global tennis stage,” he said. Nadal defeated No 28 Juan Martín del Potro 4-6, 6-0, 6-3, 6-2 to reach the final. The Spaniard has two US Open titles – 2010 and 2013 – and today’s will be his 23rd career major final.